Many people live with high blood pressure and don’t know they have it. Whether you’re aware of your condition or not, it harms your health over time if it goes untreated. 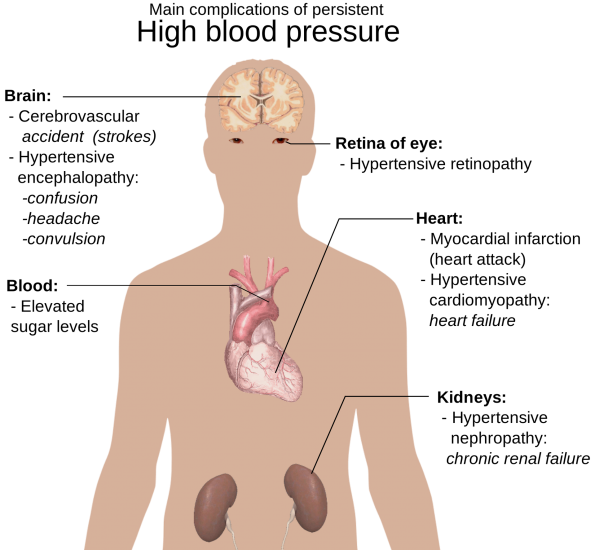 There are many symptoms uncommon in most people with high blood pressure — unless their lives are in immediate danger. Here’s how to tell if your blood pressure is out of control — and what you can do about it. There are many different types of headaches, and their root causes vary. According to Harvard Health, headaches may be the only sign of high blood pressure in some people. If you’re suffering persistent headaches and that’s not normal for you, your blood pressure could be to blame. Severe headaches could signal something called a hypertensive crisis — which actually needs immediate medical treatment. If a health professional has given you a list of guidelines to follow to control your high blood pressure, and you aren’t following that list, your life could be in danger. The National Heart, Blood, and Lung Institute warns that not taking charge of your blood pressure can lead to serious complications. These include kidney disease, eye damage, and even devastating damage to your brain. Resistant hypertension, or resistant high blood pressure, occurs when your blood pressure levels don’t respond as readily to lifestyle changes and medications as they should. You might have to continue to make behavior changes, try new medications, and monitor your pressures to figure out when they’re at their highest and why. If you don’t put in the extra effort, you’re putting your health at risk. According to Mayo Clinic, chronic, uncontrolled high blood pressure can become life-threatening. Long-term damage to your arteries can put you at risk for an aneurysm. Consistent high readings can also lead to heart disease, heart failure, and increase your risk of having a heart attack. You could also have a stroke or develop dementia. Doctors interpret your blood pressure using two different numbers. According to the American Heart Association, the top number should read less than 120, and the bottom number should read less than 80. If your blood pressure reads 160 over 100 or higher, you’re at the highest stage of hypertension. Anything higher than 180 over 110 requires immediate medical attention. Usually, medication and a number of lifestyle changes work together to effectively keep your blood pressure within a safe range. According to Healthline, exercise can make a huge difference — around 150 minutes of moderate activity per week. Limiting your added sugar, alcohol, and processed food intake also helps. Make sure you’re managing your stress and getting enough sleep, too.